The other day now I went to our local wholesale place and picked up some thread. While this thread looks pretty linty the embroidery thread I use isn’t this way at all. Unfortunately they were out for now! I was needing some white embroidery thread which is my thread of choice for FMQ, but they didn’t have what I went for, so I ordered it. Hopefully I can pick it up on Wednesday. But I did get a couple other thread spools. Comparing a 1000 meter spool to a 30,000 meter spool! It’s funny, actually. This big spool of thread is 30,000 meters! That’s a lot of thread! I have been going through thread faster than ever since I got the Juki, so since they had three in stock, I picked up one of these big guys! 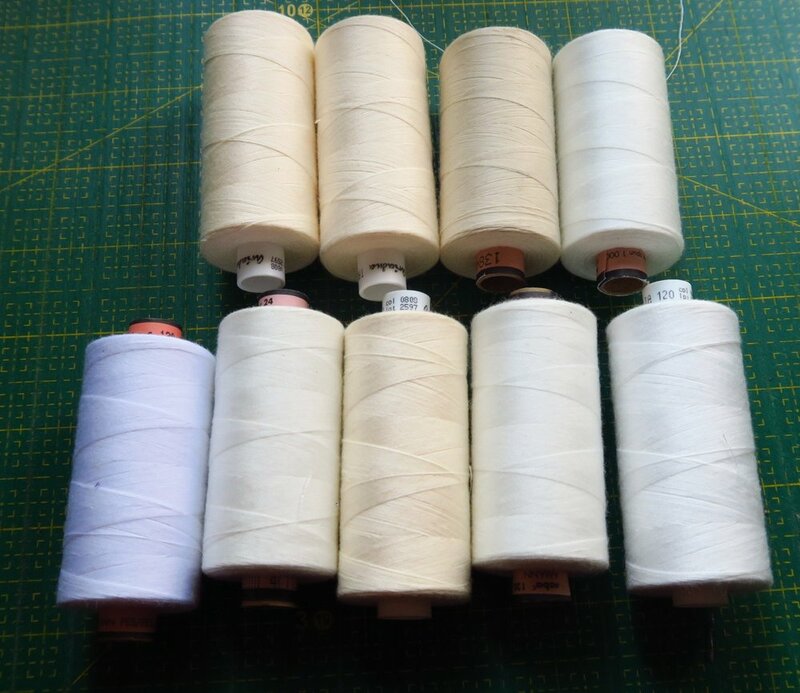 And I picked up several smaller off white spools of thread similar to Guterman. Some of it is German, and some of it Polish. I paid 3,50 zl/spool ($0.92) for the Polish kind and 4,50 zl ($1.19) for the German kind - 1000 meter spools. This is good thread - not your cheapo polyester thread you buy at the Walmart for 10/$1 - used to be - or maybe it’s gone up to $1/spool nowadays. I’m including the cost because I’m sure you are curious. But please remember, I’m getting this from a wholesale place - designed especially for businesses to buy from. There seem to be a lot of small manufacturing businesses who buy what I now think of as “my” local findings place!. The large spool was 49,90 zl or $13.17 in USD. That is the equivalent of 6 smaller spools of 5000 meters (or yards) of thread. So, that’s still not too shabby, even though they went up $3 since the last time I bought it. I thought this was an interesting purchase that most of you might like to see! Thread is definitely not one of my major purchases (cost wise) with regards to sewing, though of course it does add up. But compared to walking into your typical store and buying a small spool for $3.95, I pay nothing. And that’s all for today from my part of the world! Have a great day wherever you are reading this!